The latest issue of Decies has just been published. There is the usual fascinating collection of articles. Of particular interest is the article by Margo Griffin titled From Waterford to Worcester: Records from a Massachusetts Archive. This tells the story of Richard O'Flynn (1829-1907) of Newtown, Kilmacthomas who settled in Worcester, Massachusetts in 1851. He opened an antiquarian bookshop which was commercially successful. He was a founder of the Worcester Society of Antiquity and had a particular interest in recording the history of the Irish in Worcester. All of his research was recorded in twenty folio volumes. 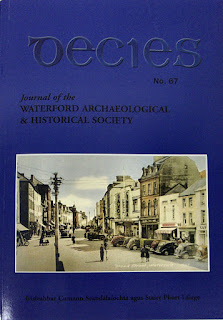 This article refers to the Co Waterford people recorded by O'Flynn. These include fascinating pen pictures of the individuals, such as Jeremiah Kane of Dungarvan who became one of Worcester's famous detectives. There are people from Stradbally, Dungarvan, Ring, Mothel, Kilmacthomas, Fenor etc. Copies of the journal are on sale at the museum at €20.